Xylem is a product of the collaboration between designer Bryan Allen and sculptor Stephanie Smith. It is based on the translation of natural forms through analog to digital 2D representation and analysis into a re-physicalized 3D form. The final form evokes the Xylem layer of tree cells: reducing structure and enclosure to a minimum while still maintaining form. Using a Type A Series 1 printer in conjunction with Rhino 5 design software, the form was fabricated as 44 individually PLA printed panels. For two months straight the printer ran non-stop without failure producing all the compete components with registration numbers for placement. The parts were assembled on site by the artists. 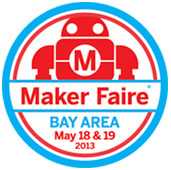 Make sure to drop by Type A Machine booth at Maker Faire Bay Area at the San Mateo County Event Center on May 18th and 19th where you can get a closer look at this project.The Type A Machines team will also provide demos of their latest new product developments, to give you an exciting glimpse of innovative techniques for 3D printing. Also, remember to join the Type A Machines group at www.RhinoFabLab.com too.